The evolution of bipedalism in fossil humans can be detected using a key feature of the skull—a claim that was previously contested but now has been further validated by researchers at Stony Brook University and The University of Texas at Austin. Compared with other primates, the large hole at the base of the human skull where the spinal cord passes through, known as the foramen magnum, is shifted forward. While many scientists generally attribute this shift to the evolution of bipedalism and the need to balance the head directly atop the spine, others have been critical of the proposed link. Validating this connection provides another tool for researchers to determine whether a fossil hominid walked upright on two feet like humans or on four limbs like modern great apes. Controversy has centered on the association between a forward-shifted foramen magnum and bipedalism since 1925, when Raymond Dart discussed it in his description of "Taung child," a 2.8 million-year-old fossil skull of the extinct South African species Australopithecus africanus. A study published last year by Aidan Ruth and colleagues continued to stir up the controversy when they offered additional criticisms of the idea. However, in a study published in the Journal of Human Evolution, UT Austin anthropology alumna Gabrielle Russo, now an assistant professor at Stony Brook University, and UT Austin anthropologist Chris Kirk built on their own prior research to show that a forward-shifted foramen magnum is found not just in humans and their bipedal fossil relatives, but is a shared feature of bipedal mammals more generally. "This question of how bipedalism influences skull anatomy keeps coming up partly because it's difficult to test the various hypotheses if you only focus on primates," Kirk said. "However, when you look at the full range of diversity across mammals, the evidence is compelling that bipedalism and a forward-shifted foramen magnum go hand-in-hand." In this study, Russo and Kirk expanded on their previous research (published in the same journal in 2013) by using new methods to quantify aspects of foramen magnum anatomy and sampling the largest number of mammal species to date. 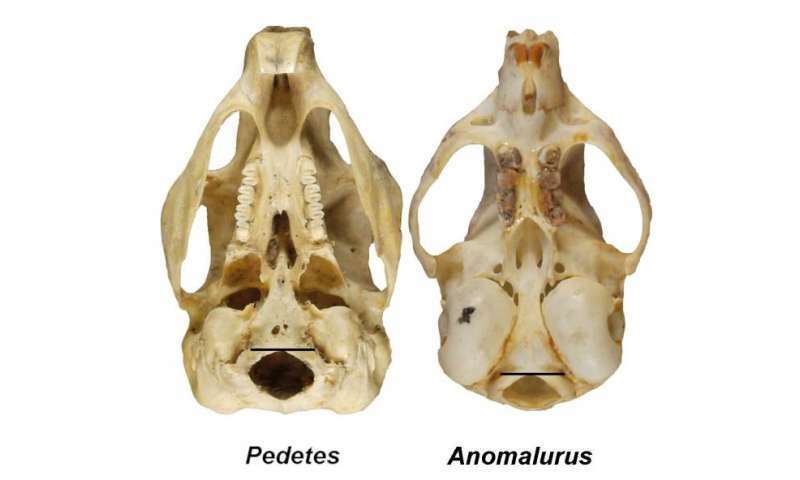 To make their case, Russo and Kirk compared the position and orientation of the foramen magnum in 77 mammal species including marsupials, rodents and primates. Their findings indicate that bipedal mammals such as humans, kangaroos, springhares and jerboas have a more forward-positioned foramen magnum than their quadrupedal close relatives. "We've now shown that the foramen magnum is forward-shifted across multiple bipedal mammalian clades using multiple metrics from the skull, which I think is convincing evidence that we're capturing a real phenomenon," Russo said. Additionally, the study identifies specific measurements that can be applied to future research to map out the evolution of bipedalism. "Other researchers should feel confident in making use of our data to interpret the human fossil record," Russo said.